This bridal shower invitation is balanced with two symmetrical ornamental designs decorating the top and bottom of the invitation front, focusing the viewers’ eye on the date at the center of the page. Here are the fonts that have been used in the bridal shower invitation design above. Like this bridal shower invitation? You can personalize it with your own wording and details at Elli. Nelly Script is a handwritten typeface designed by Crystal Kluge and Stuart Sandler from Tart Workshop. Being a beautiful yet sensible romantic typeface, Nelly Script is a perfect choice for invitations and announcements, especially those of the romantic nature. The typeface comes complete with a handful of alternate lowercase forms in OpenType format. 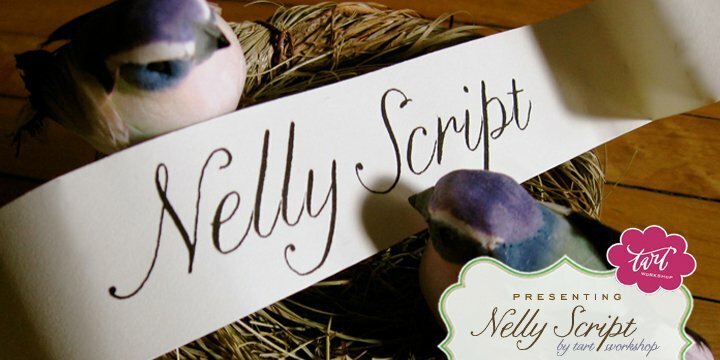 You can buy and download Nelly Script at Myfonts.